School of Cross + Hop N Hurl Race Cyclocross Race Report – Tri. Hack. Eat. 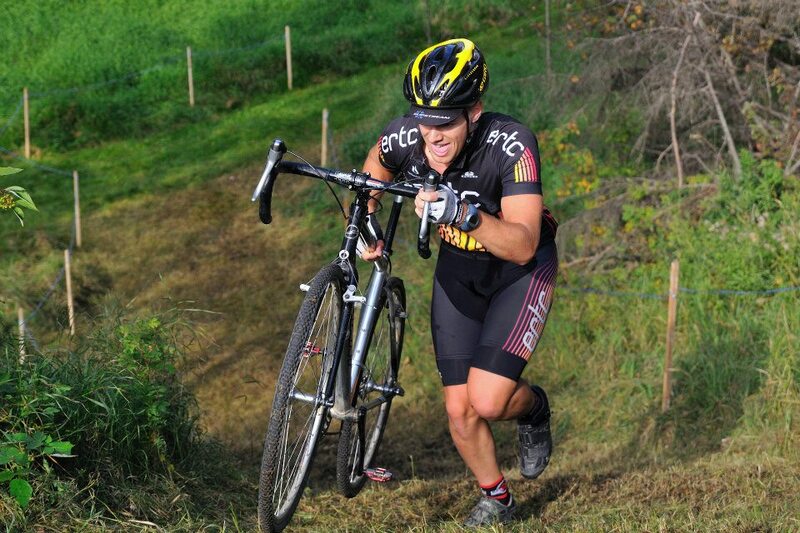 Since I am still a Cat 5 Road Racer, I was placed into the most beginner category of Cyclocross racing, “Sport”. Despite shifting my focus back to running and having not ridden either my road or cross bike at all in the past month, I still did quite well and felt stronger than many of my competitors in both races. My downfall was definitely being timid in the beginning of both races due to my lack of experience with steep descents, single track, and technical cornering. I plan on getting at least two more cross races in this season and plan on spending a lot more time on the cross bike before the start of next season to help get used to technical riding. In hindsight, establishing a good starting position out of the opening sprint is super key, even more so than in Crit racing. If you aren’t in the top 10, you end up bottlenecked behingd 20 to 30 racers who are both slower and less proficient in the corners. I estimate that the leaders gain 2-3 seconds on you through every corner in the opening lap. I made the mistake in both races starting deep behind the leaders. I estimate about 30 back in both races. After things finally spread out, I managed to climb about 15 or so spots in both races. I definitely made a ton of ground up over the barriers and sand pits as most of the other riders don’t have the top end running speed that I am capable of. But in the end, you can only pass/catch so many people in 40 minutes when you’ve given the top 20 riders a minute head start in the first lap. Next year I definitely intend on racing a full cross season with intentions of upgrading to “Expert” which is always easier said than done. I think I will have some added fitness as well as bike handling abilities. Right now I am back to building base for next year so I can start hard in March and hopefully cycle consistently all the way to November with a few small breaks in the middle. I am quite happy with both races, I maintained a pretty high threshold for both races and felt like my legs were completely shot at the conclusion of both races meaning I was working hard enough. I would have finished in approximately 11th place in Hop N Hurl had I not kicked my chain off the little ring when I was hurling over the barricades. Oh well!